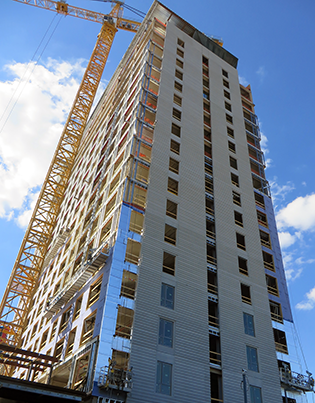 In North America, mid to high-rise residential structures are typically cast-in-place reinforced concrete offering such benefits as low floor-to-floor height and fireproof construction. With similar benefits, low to mid-rise buildings (eight stories and under) often utilize reinforced masonry bearing walls supporting precast slabs. These structural systems are time-consuming, weather sensitive and labor intense. For many, there has been a long-standing desire to bring the advantages of structural steel to the multi-story residential market. With the abundant use of steel for high-rise commercial structures, builders, developers and engineers have long recognized its qualities and benefits. However, until now the industry has been forced to adapt steel based systems used for commercial buildings but not ideal for residential construction. Structural steel systems with poured concrete decks for commercial projects cannot achieve a low floor-to-floor height and requires ceilings to conceal beams, joists or deck. Girder-Slab Technologies, LLC set out to develop a more efficient steel based framing system for mid and high-rise residential construction. Conventional wisdom for using steel has been to maximize spans and provide universal products that fit nearly any building type. Girder-Slab Technologies, LLC chose a rather unorthodox approach to find a solution. First, we determined that precast slab units, common in the mid-rise residential market, combined with a steel frame could offer speed, design flexibility and value. Although residential unit modules typically vary within a floor, they generally stack vertically for structural support, utilities and shafts. After considering the modular nature of residential construction, it was concluded that long-span precast slabs in combination with short span steel girders would be both appropriate and efficient. 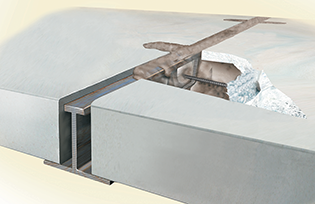 Our D-BEAM® girder overcame the issue associated with a standard wide flange beam sitting below the slab. The D-BEAM® girder fabrication process begins with a standard wide flange section that when uniquely cut through the web produces two equal T sections. 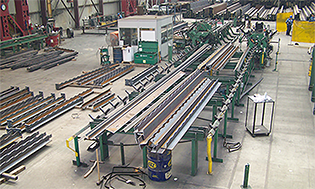 The fabricator then welds a flat bar to create the top flange resulting in two D-BEAM® girders from one parent beam without waste. With practically an unlimited source of supply, the D-BEAM® girder is manufactured by your local steel fabricators as part of a complete structural steel package. 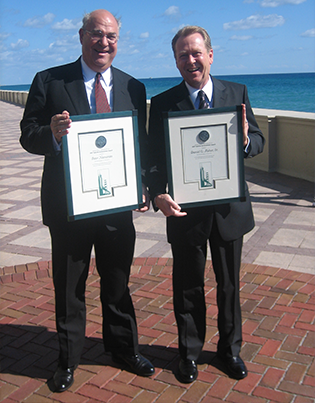 Managing Partner Dan Fisher Sr. and Engineering Partner Peter Naccarato P.E. are recipients of an AISC Special Achievement Award. This award provides special recognition to those who demonstrated notable achievements in structural steel design, construction, research, or education. The GIRDER-SLAB® system has been recognized for making a positive and substantial impact on the structural steel design and construction industry, specifically for its contribution as a structural steel based solution to multi-story residential structures.